Today was a photoshoot for my interview thing. At first we went on a cliff to take pictures for the magazine. The photographer was very good and knew what to do. She had good ideas for the photos and gave good directions. I have always taken a photo where all my hair is spread around my head – and now we did. Then we continued taking photos on the cliff and I have always wanted a professional photographer to take photos of me in general so it was a perfect situation and I was in no hurry at all. She also made me dive into a flower bush and in the forest. It was great. But when the sun started to set the mosquitos came in like a plague. They were all over me when I tried to calm myself for the photos, standing in a flower bush while I was being eaten alive. I couldn’t believe how they got through even my thick black pantyhose. I was so eaten up at the end of the photoshoot but oh my god it was sooo worth it (for what I had seen from the photos taken). The photographer said that I would get the photos myself approximately at the end of this month... I can’t wait. And the interview is coming out on this Fall. 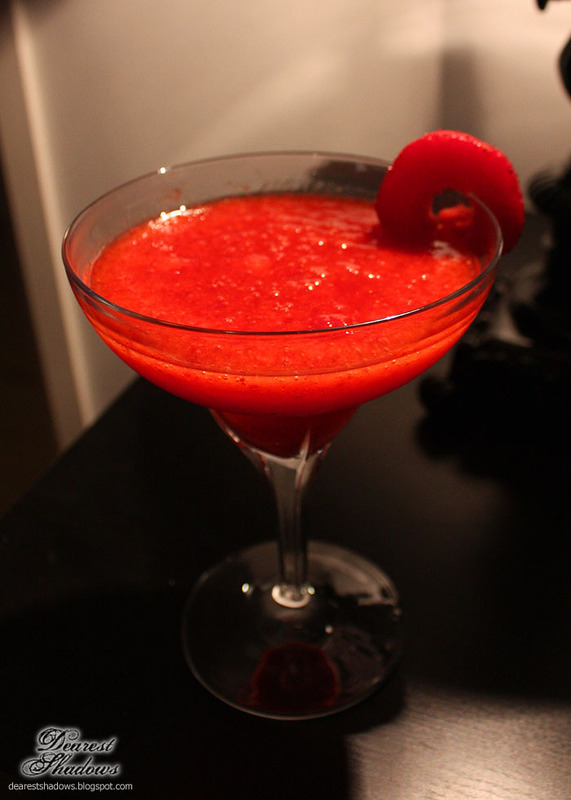 The rest of the night went by making Frozen Strawberry Margaritas and listening good music. 1. Pour the ingredients into a blender and blend until smooth. 2. Pour the contents into a chilled margarita glass and garnish with a fresh slice of strawberry or lime. Simple as that! And put on some good music! !